It’s been less than a month since a tractor-trailer slammed into a line of cars stopped in a construction zone, killing 6 people in Tennessee. 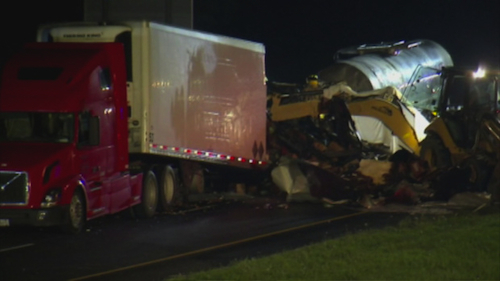 Now, a similar situation has killed 5 more people after a truck driver failed to slow at a construction site in Northwest Indiana, early this morning. 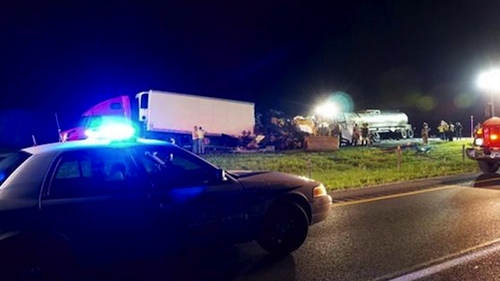 According to Indiana State Police, the crash occurred just after 12am Friday on I-65 in Tippecanoe County near the State Road 43 exit. Sgt. Kim Riley said the incident occurred in the southbound lanes and involved two tractor-trailers and five four-wheel vehicles. A red tractor-trailer carrying frozen chicken had been doing the right thing and slowing for construction, along with a Honda Pilot and a Toyota Yaris slowing right behind the truck. Then a second tractor-trailer carrying cooking oil came along and instead of slowing down, the truck driver rear-ended the Toyota and sent it flying off the roadway, instantly killing the driver. The tractor-trailer continued its southbound path, rear-ending the Honda and then the truck carrying the chicken. The impact was so severe it sent the Honda spinning into both semis and ignited a fire in all three vehicles. By the time first responders arrived at the scene, the Honda and the cooking oil truck were engulfed in flames and the truck driver and all four people in the Honda were dead. 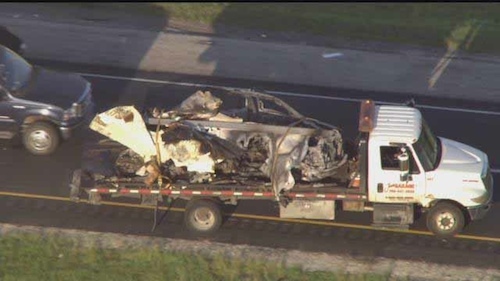 The victims have been identified as 34 year-old truck driver Pankiv Ruslan of Illinois, 47 year-old Honda driver Jill E. Buck of Indiana, and her two children, A. J. and Branson, ages 8 and 10. The driver of the Toyota, 41 year-old Mikhail Yuryevich Stepanov of Lafayette also died at the scene and his passenger, 31 year-old Tatiana Yuryevna Stepanova was severely injured in the crash. The three other vehicles involved in the incident were lucky to escape with only minimal damage. The I-65 northbound lanes were able to reopen around 6:30 a.m. but the southbound lanes of remained closed near Lafayette into Friday afternoon. Saw that on my local news. Unnecessary accident and loss of life. yep. especially when 2 kids have to die too. I watched this happen behind me. Not pretty. The mother that was killed I went to high school with. They have u drive 75 through construction out west! It has little to do with Soren and lots to do with paying attention in work zones! Stop importing drivers to drive trucks on our highways. If the industry thinks there's a driver shortage, then start fixing the root cause of the problem. Low pay and lack of home time. Stop lowering the standards just to put someone with a heartbeat behind the wheel of a truck. As long as humans have had vehicles to drive accidents have been happening. Model A's had accidents. It won't stop. I would say he was texting and not watching the road.but really how many people even slow done to the speed that sign say? We helped a driver in New Mexico last night that was Russian. Spoke very little English I had to use the translate app on my phone to see what he needed. Maybe this guy who's name doesn't sound local can't read the signs.